"Don't Say Things You Don't Mean"
(1971) "How Can I Unlove You"
"How Can I Unlove You", was released as a single in August 1971, shortly after her previous hit, "You're My Man", peaked at No. 1 on the country charts, where it spent three weeks at the top. 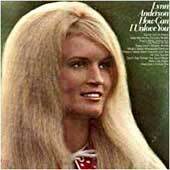 Anderson had recently enjoyed the biggest hit of her career, "(I Never Promised You a) Rose Garden", in February 1971. "How Can I Unlove You" reached No. 63 on the Pop charts, the same position as her previous No. 1 country hit, "You're My Man". "How Can I Unlove You" was written by Joe South, who had also written "(I Never Promised You a) Rose Garden". The song was produced by Anderson's husband at the time, Glenn Sutton, who had also produced "(I Never Promised You a) Rose Garden". A Bluegrass version of the song was recorded by Anderson for her Grammy-nominated 2004 album, The Bluegrass Sessions. ↑ Whitburn, Joel (2004). The Billboard Book Of Top 40 Country Hits: 1944-2006, Second edition. Record Research. p. 27.